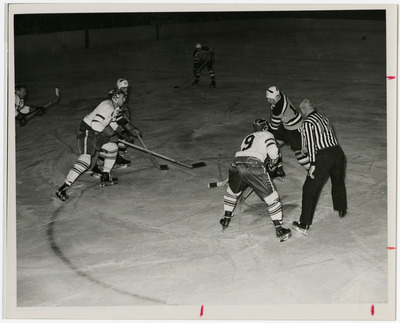 Photograph of UND hockey player Wayne Gurba (9) taking a face-off versus the Colorado College Tigers. A native of Flin Flon, Manitoba, Gurba played at UND from 1962 until 1964 and was a member of the 1963 NCAA Championship team. This photograph can also be found in the 1964 Dacotah Annual, page 79.